One thing that I felt my graduate program could have helped better prepare me for was teaching behavior management techniques for mixed groups. 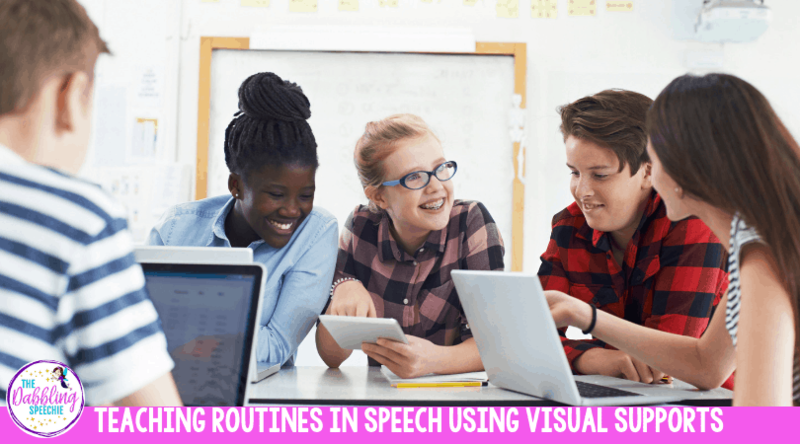 Anyone else struggle with how to create positive behavior routines in speech therapy sessions? I sure did when I first started out. I got my feet wet during my field placements when I did group therapy (aka mixed group madness). But, my real education came when I was a CFY-SLP. Between lesson planning for all the goals in the group, managing behaviors, and trying to take data, I felt very stressed in some of my groups. Doing all those things at once was really difficult. And some days, I didn’t know how to manage a behavior. Or I was so busy trying to manage behaviors, that I didn’t get to goals/lessons that I wanted to. Then, there are days when incorporating everyone’s goals in the lesson and keeping students engaged led me to completely forget to take data. 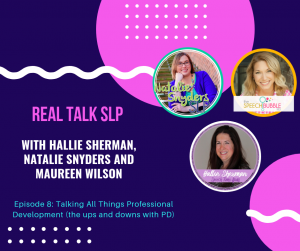 Have you ever been there as an SLP? In my first few years, I focused on creating simple rules and expectations. I had a raffle prize box and the students could earn a jelly bean for not getting more than two reminders about behavior. This was the system my master clinician modeled for me. It worked well with keeping my groups in order as I managed a 75+ caseload. Many groups had 4-5 students, so I felt like I didn’t have time to mess around and needed tangible incentives for my students. 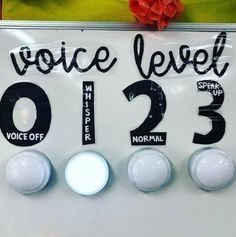 Having behavior management techniques in your speech room increases students’ engagement, and improves participation with the lesson being taught. 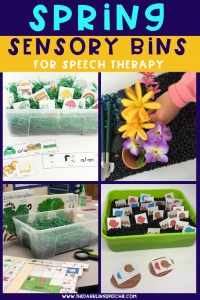 To be effective with implementing your therapy lesson, you need a plan containing strategies for being consistent with expectations. Furthermore, it is also important to foster a positive learning environment while minimizing unwanted behaviors. -Use simple rules and expectations that are consistently and fairly implemented. -Make events and activities predictable by establishing routines. 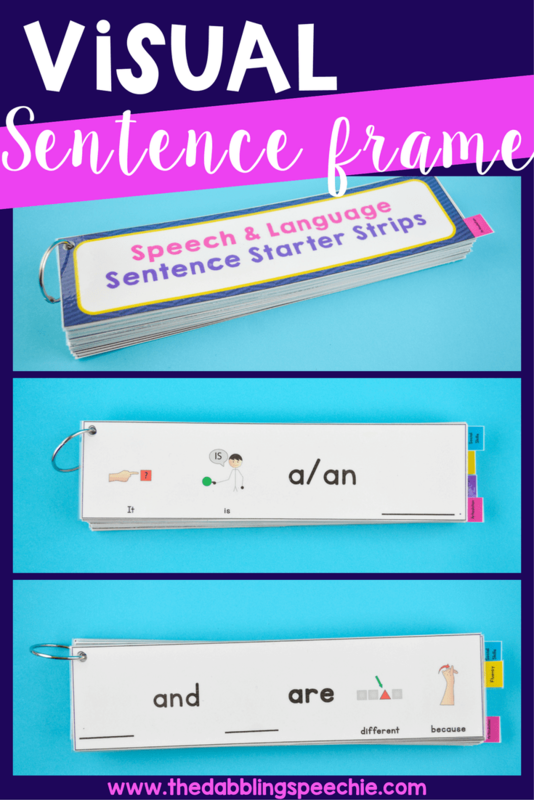 Set up cues and signals with students to let them know about transitions in the lesson and/or explain the content or length of the lesson. 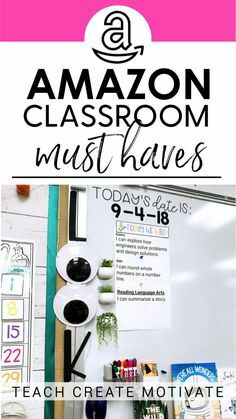 -Make adjustments and accommodations to help all students access the lesson and successfully engage in the content (this may mean shortening the assignment, creating visuals, or answering choices to help participation). 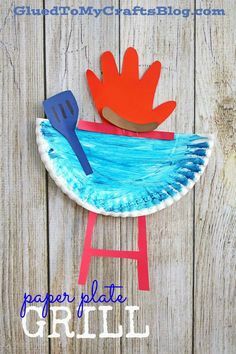 -Give opportunities to respond and participate in the activities and materials with all the children in the group/class. For more research-based classroom management strategies, read this blog post with helpful tips to use with students. 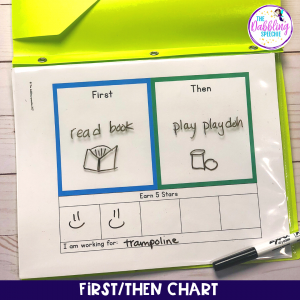 During a lesson, your students have to follow the set rules, transition to a new activity, and participate in the session. That can be overwhelming for our SLP friends. Some of our students struggle with following our complex directions. For example, Devon may remember to raise his hand to speak, but is constantly getting out of his chair during instruction. This causes a lot of distraction for you and the group. He knew the expectation to raise his hand to speak, but his body was struggling to follow the expectation that during reading time, we all have to sit in our chairs. Research has shown that children who are exhibiting less problem behavior show bigger gains in language skills. 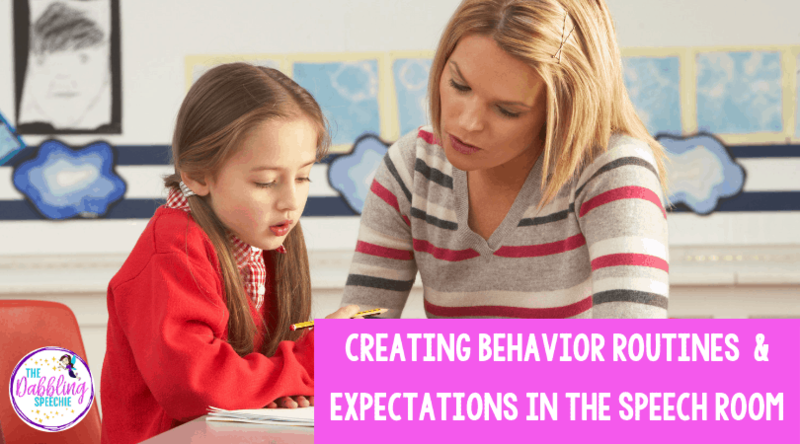 So, teaching behavior expectations is very important for speech pathologists. If we can decrease the presence of unwanted behaviors, we will increase the opportunities for meaningful participations in the session. Justice, L.M., Jiang, H., Logan, J.A., & Schmitt, M.B. (2017). Predictors of language gains among school-age children with language impairment in the public schools. 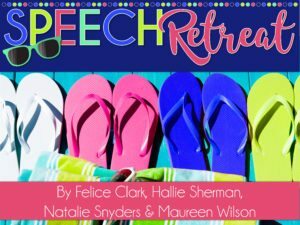 Journal of Speech, Language, and Hearing Research, 60, 1590–1605. Our students on the Autism Spectrum process information better when given visual supports paired with verbal directions or expectations. 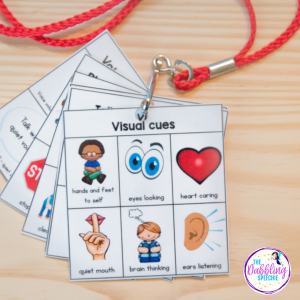 Visual supports are picture/written word cues that are paired with a verbal cue. 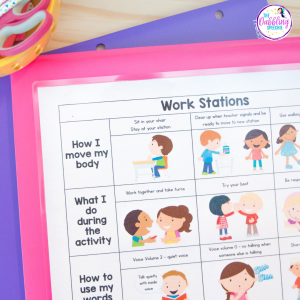 This helps your student process information about the behavior routines, skill, or activity. 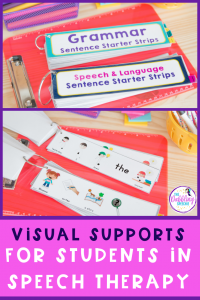 Visual supports you may use with your students could be: pictures, written words, objects, arrangement of the environment, visual boundaries, schedules, maps, labels, organization systems, timelines, and scripts. 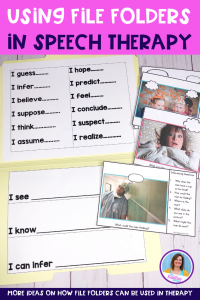 Furthermore, visual supports meets the evidence-based practice criteria set by National Professional Development Center on Autism Spectrum Disorder with 18 single case design studies. You can learn more about this evidence-based practice HERE. I would also suggest following the school or classroom behavior management system. By using our own elaborate system, we could be confusing our students. Remember, the best practice is to be consistent! So, I have my own behavior routines for my small groups that I follow. But when my students need more support, I follow the behaviorist’s/teacher’s recommendations. For example, I have some students using “Working For” charts for “First/Then” charts. I don’t use those supports with my whole caseload. 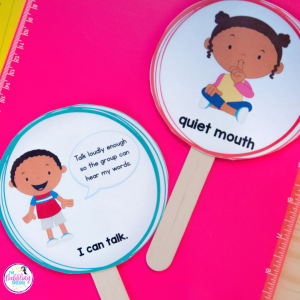 You can find some handy behavior visuals with these charts in my Behavior Visuals resource. Because I have a large caseload and not always the time to visually write out my therapy lessons on the board, I use a generic therapy structure that I can reference every session. This allows me to change things up, but still follow a consistent, predictable routine. 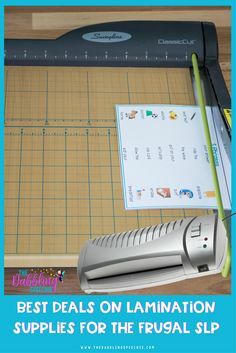 The other important tip is to have visual supports that break down the skills you want your students to use. 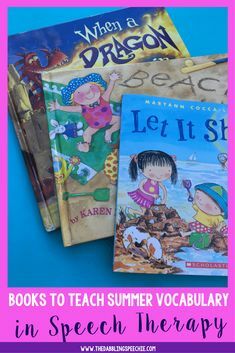 During a book activity, you have to teach your students how to answer questions while you are reading the book, what their bodies should look like, and the voice volume they need to have while listening to the book. 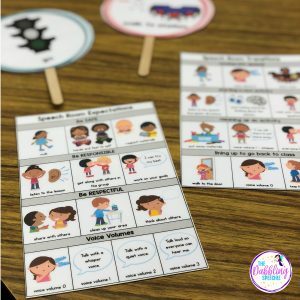 I use my behavior visuals to teach expectations for transitions, playing a game, and doing a group activity. We even work on the expectations for classroom activities too. 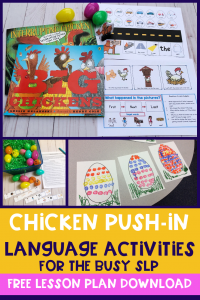 These behavior visuals have been really helpful for teaching the routines of my push-in lessons when students have to move to a new station. When I use the visual supports to share the positive things I am seeing, it naturally helps me ignore the unwanted behaviors. A long time ago, I used a speech reward system with raffle tickets, prize boxes, and earning a jelly bean for each session. It was a LOT to manage. 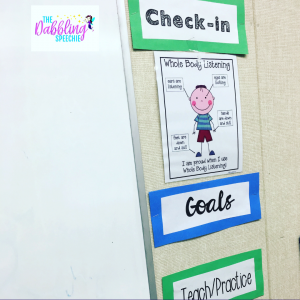 The past few years, I made a goal to focus on teaching routines and making my lessons engaging. I got rid of my prize box about four years ago because it stressed me out, trying to keep it filled. You can hear more about why I got rid of my prize box on a facebook LIVE video I did HERE. I am happy to report that when you put the efforts into teaching behavior routines and bring in materials that motivate your students, the unwanted behaviors GO AWAY. 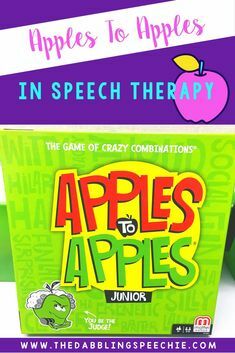 What behavior strategies do you use in the therapy room? I would love to know the tools and resources that have been helping your students. 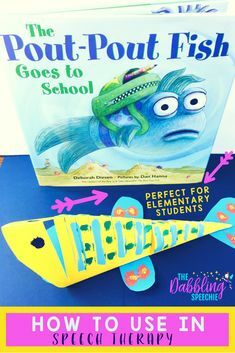 Share in the comments or email me at feliceclark@thedabblingspeechie.com. 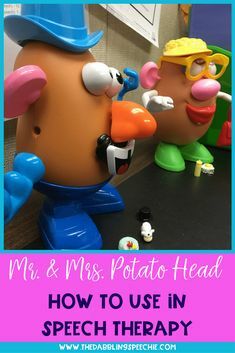 I would love your whole body visual for my lunch bunch groups. I can’t fond it. It is in my newsletter freebies library. If you are a subscriber, you just use the password to get access.